"PaltalkScene" belongs to the group of so-called instant messenger systems, with which you can write instant messages or chat with friends. What is special about "PaltalkScene" is the fact that the software to many competitor systems like AIM , MSN or Yahoo is compatible. "PaltalkScene" is a freeware product available free of charge and available in English only. 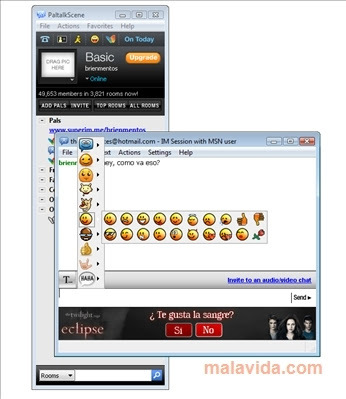 "PaltalkScene" is a classic instant messenger with all the functions, as they are known by ICQ or AIM. So video conferencing or audio streams are possible as well as sending instant messages or a small real-time chat. The highlight of "PaltalkScene" is the opportunity to interact with people of other platforms in contact without having to use their messenger program. Thus supports "PaltalkScene" the logs from AIM, Yahoo and ICQ. In "PaltalkScene" own area can open up spaces for up to 250 people, and manage password-protected rooms for up to 10 people. In addition, the program supports over 4000 different kinds of chat rooms. One for all - that is the motto of the instant messenger tools "PaltalkScene". The program is easy to use despite English menu navigation very simple and can import contacts from various other chat programs with just one click. Moreover, there is also no limit on the contact list, you have any number of people. "PaltalkScene" runs on all computers with a Microsoft operating system, Windows XP , Windows Vista or Windows 7 feature. Moreover, should at least 1 GB of RAM to be present. A webcam or other special hardware requirements, however, are not mandatory.